‘Calf of Man Lower Lighthouse’ limited edition prints available. Click on image to preview graphic layout to the print. Main picture- ‘Calf of Man Lower Lighthouse’, built by Robert Stevenson in 1818, with ‘Chicken Rock Lighthouse’ in the Background. Black and white interior view of lighthouse keepers’ sleeping quarters, Chicken Rock. Detail depicting cast iron “dolphin” Handles from Calf lower light lantern. Broken glass cullet was removed for weather proofing when restoration work was taking place. 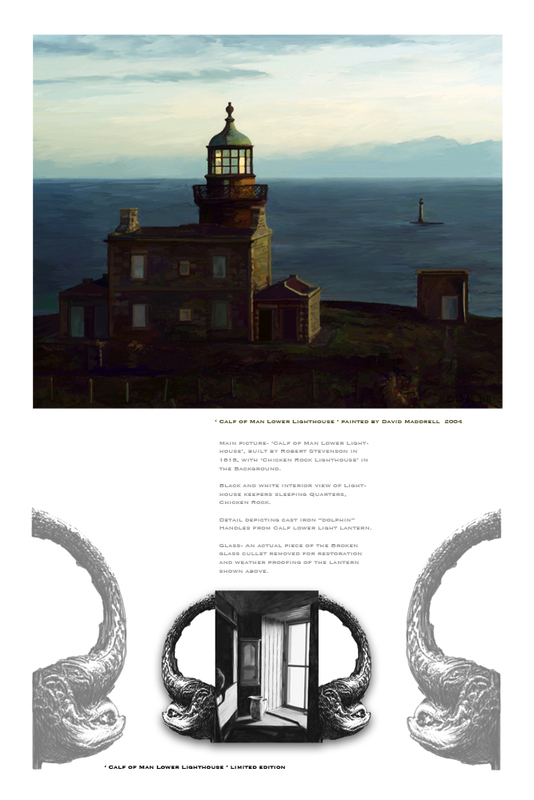 An actual piece of the glass from the lantern of the Calf of Man Lower Lighthouse is included with each print. Individually signed and numbered in pencil + embossed with artists stamp. A3+ archival matte print, archival inks. Print comes mounted and shrink wrapped. The piece of glass cullet is abraded to remove sharp edges and incorporated into cutaway window in the mount, below the print. Price £65 + P&P if applicable. Please contact to contact. You are currently browsing the David Maddrell weblog archives for July, 2006.